It is with great sadness, we announce the sudden passing of husband, father, son, brother, nephew, uncle, cousin, friend, and leader, Barney Provost. Barney was born to Dila Provost and Leslie Barney in Minneapolis, Minnesota. Barney lived his early life in Minneapolis, Minnesota, Calgary, Alberta, Portland, Oregon, and Spokane, Washington, however his home was always the Piikani Nation. He later became involved with his own Siksikaitsitapi traditions. Barney honored his Blackfoot Ways and was a member of the Horns Society and the Brave Dog Society. Barney lived his entire life drug and alcohol free. Barney excelled in academia and sports. He graduated from high school in 1994, he then lived and worked on the Pacific Island of Vanuatu, coaching the Vanuatu Men’s National Basketball team. He attended Augustana University and played for the Vikings Basketball Club and later graduated with Bachelor of Arts Degree in History. On his travels he met his spiritual brother Mr. Stan Blue Horse, introducing him to the Sundance ways of the Great Sioux Nation. He obtained a Bachelor of Education Degree and later earned a Master of Education from the University of Lethbridge. Barney was a teacher and Vice Principal at Piikani Nation High School, and later a Principal at the Tsuu’tina Senior High School. 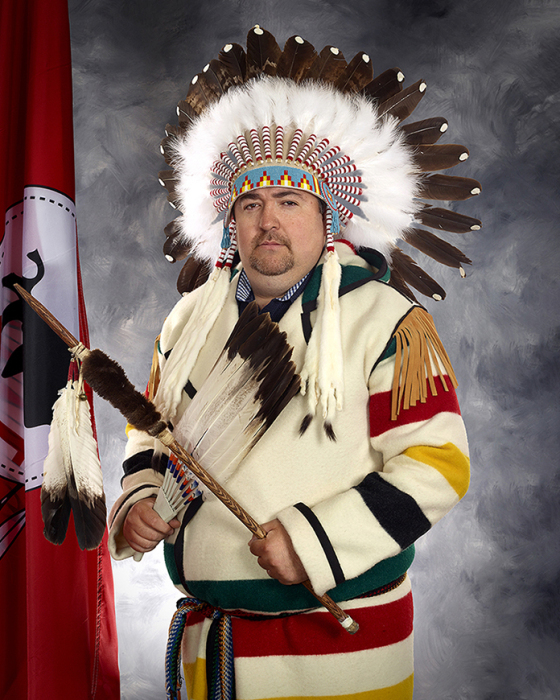 In 2015, Barney was elected to the Piikani Nation Chief and Council, where he was an acting council member at the time of his death. Barney worked tirelessly to put the needs of his community first. He took initiative in housing projects, setting a goal of adding 200 houses in Piikani before his term ended. Three years into his four-year term, he accomplished this goal. Barney was the voice of the many who were voiceless and advocated for the marginalized population. Barney will be remembered as a strong leader who wanted the best for his people. Barney lived a full life with endless accomplishments and successes, but none of which could compare to the family he built with his wife. Barney’s life began when he met Kristy in 2002, his true love. Barney and Kristy married in 2009, and had four beautiful children Tess (2005), Payton (2007), Bryleigh (2011), and Declan (2013). Barney loved to explore and take his family on trips, sharing new experiences and teaching his family to stop and take in the beauty of the world. Barney was a present and doting father and husband, and loved his French Bulldog, Q-Bert. Barney is survived by his beautiful wife Kristy, their wonderful children Tess, Payton, Bryleigh, and Declan; His mother Dila Provost, brothers Terry (Dimples), Toby (Edna), Vance, Vaughan (Shawnna), Riel (Kimmy),sister-in-law Courtney and numerous nieces and nephews; His Minnesota siblings: Angela, Leslie Jr, and Leon Barney; His God Children: Maddie Cross Child and Destyn Wolf Child; Uncles: Howard (Pinki), Edwin (Joslin) and Aaron (Rachel) Yellow Horn; Aunts: Loretta and Katherine Follett of Minnesota; Adopted father Bernard Houle; Adopted brothers: Rod Scout, Eddie Wolf Child, Truman Soop, Leo West, Donnie Stump, Darren Iron Shirt, and Trevor Prairie Chicken and Tom West. Barney was predeceased by his father Leslie Barney, his brother Bradley Barney, mother-in -law Judy Day Chief, Grandparents’ Albert and Delma Yellow Horn, uncles Frank Barney, Roy, George, Vern and Rocky Yellow Horn, aunties Bella and Elaine Yellow Horn, cousins BJ Crow Shoe and Lukey Yellow Horn. A Family Service will be held in The Chapel of Eden’s Funeral Home on Thursday, July 5, 2018 at 2:00pm. The Wake Service will be held at Multipurpose Building in Brocket immediately following the Family Service. A Funeral Service will be held Pow Wow Arbor in Brocket on Friday, July 6, 2018 at 11:00am.